I can imagine you are mildly confused. Yes, someone's really working on a North Korean Set. No, I am not affiliated with North Korea, or am I? Yes, this set is on BaNaNas. So I was looking for country specific NewGRFs, and when I found a Korean train set, I wondered why there was no North Korean Train set. Because, who wouldn't want to play a scenario in a country, run by your favourite barnyard animal. Only steam locos remain. PM if you're interested in helping out. - Tanker wagon: Danmack, PikkaBird and uzurpator. Fixed: Introduction year of the Juche EMU. Changed: Oil Crisis mechanics changed with variable running costs like JapanSet has. Changed: Redid the metros, switched the positions of the electric locos to be after the diesel locos, tweaked Red Flag 1 and Chongi50 graphics. Changed: Train type icons in the purchase Window. Disclaimer: Please don't take things too serious here. This NewGRF has been born out of a jokish idea. This NewGRF was never meant as a political statement. This NewGRF is not made with the intention to insult anyone, including the people of North Korea. I am sorry if you are offended in any way with this NewGRF, this post, or any related post on any forum. Except if you're the Supreme Leader. I, the author, do not approve of the actions of the government of the DPRK, who starve, brainwash, torture and enslave their own people. Last edited by Erato on Sun Aug 19, 2018 4:24 pm, edited 31 times in total. What a truly novel idea! I can now imagine a scenario which includes Japan, South and North Korea, and eastern China in an economic trade zone. Yeah they do. Most of them are from the 70's though. I was joking I actually read some interesting travel-around-NK-with-a-train journal once. They have quite a bit of track there, even if they are in a sorry state by and large. And they certainly have a large % of their transportation on rails! Not that they have all that much transport around, but at least they like trains. Gotta appreciate something. It would be good to see some modern Russian stock too, as the international trains would pop an NK carriage up the back. The first actual update TBH. It should be completely compatible with r01 and r02. Added: Russian International wagon. And yes, it really does have the Russian flag printed on it. Changed: Fixed it so the passenger wagons are the right size. Note: I added the newest electric locomotive first. Because, of course I did. Anyhow. There are still 14 new locomotives/trains to be made and we still need cargo wagons. So there's quite a bit left. Anyhow. There are still only 5 more locomotives left; 4 steamers and 1 ALCO. I'm currently working on the cargo wagons, so look forward to that. Hello, my Korean Train Set is only support for South Korean trains. Any thoughts of adding pre-liberation trains? Not now, since there is no graphic sprites and no one who will make it. I understand that "Korean Train Set" is a set for South Korean trains. I am sorry if it seemed that I was disappointed by the lack of North Korean trains. I understand that that was not the intent of the Korean Train Set. I already have 3 pre-"liberation" trains; the Chongiha/du/so trains. I am currently working on steam trains that were known to be used by the Korean State Railways. I updated the set to improve playability. I also made cargo wagons with custom cargo containers, which look great. University will be starting next week so I won't be able to work on OpenTTD NewGRFs as much. The remaining engines might therefore take quite a bit longer to sprite and code. Thank you very much for the work done. Beautiful train set . r05 still identifies as version 3. Is that an oversight? Yes, that would be an oversight. Is causing any problems? Nope. Everything seems to work fine. Just got confused at first since I have OpenTTD configured to show every version of NewGRFs rather than just the newest. A suggestion for future release - please fill in the info for website, readme and changelog. And, maybe change up the description a little. This is actually quite a respectable set, I dunno how many players from Korea have actually tried it yet but more technical information and less humor might be beneficial. It got a nice shout out on the OpenTTD Facebook page today, which was neat. 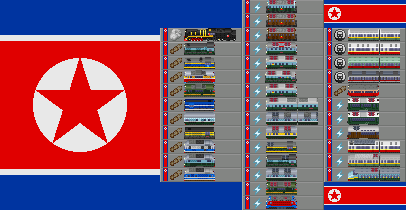 There is a serious chance that some NK government official downloaded this as OpenTTD is one of few games that their computers can run.